My best friend is getting hitched! As the date gets closer, the wedding showers and gatherings have begun–and so ran imagination with ideas for treats of all kinds. One of my favorite desserts in the whoopie pie—perfectly round little things with my kind of icing-to-cake ratio that are easy to grab and enjoy, none of that paper peeling nonsense. And how was I supposed to pass up the opportunity to make whoopie pies for my friend’s lingerie shower?? This was my first time facing the challenge of homemade red velvet. Whenever I have had it homemade it is typically a little off in color and flavor from the wonderful (and cheap) box option. I think I lucked out in my search because this was the best cake consistency I’d had the pleasure of enjoying in a long long time. And this icing was a dream in flavor and consistency. 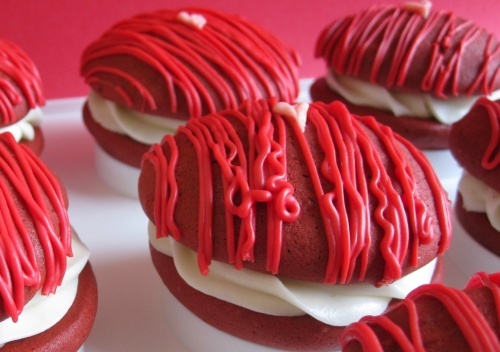 I’m sure I claim in every whoopie pie post that ‘this is my new favorite’, and I will say it again now. Whoopie pies whisk me back to ME, honeymooning with my wonderful husband, and I always enjoy sharing them with others because most people here in FL haven’t had the pleasure of a good old, saran wrapped whoopie. Position a rack in the center of the oven and preheat the oven to 350 degrees F. Line two baking sheets with parchment paper; set aside. Whisk together the flour, cocoa powder, baking powder, baking soda, and salt in a medium bowl; set aside. In the bowl of a stand mixer with a paddle attachment, beat together the butter, shortening and both sugars on low speed until just combined. Increase the speed to medium and beat until fluffy and smooth, about 5 minutes. Add the eggs one at a time, beating well after each addition. Add the vanilla and the red food coloring and beat until just blended. At this point, the batter may look too light and more pink than red, but the cocoa will darken the color considerably—so don’t panic yet! Add half of the flour mixture and half of the buttermilk to the batter and beat on low until just incorporated. Scrape down the sides of the bowl. Add the remaining flour mixture and remaining ½ cup buttermilk and beat until completely combined. Using a spoon or medium cookie scoop (which makes them round and evenly sized), drop a tablespoon of batter onto one of the prepared baking sheets and repeat, spacing them at least 2 inches apart. Bake one sheet at a time for about 10 minutes each, or until the cakes spring back when pressed gently. Remove the baking sheet from the oven and let the cakes cool on the sheet for about 5 minutes before transferring them to a rack to cool completely. In the medium bowl, beat together the cream cheese and butter on medium speed. Add the sugar and beat on low speed until combined. Add the vanilla and increase the speed to medium-high; beat until creamy and smooth, about 4 minutes. Spread the filling onto the flat side of one cake using a knife of spoon–or use a pastry bag with a piping tip. Top it with another cake, flat-side down. Repeat with the rest of the cakes and filling. For the first time, I chose to decorate the tops of my pies with candy melting wafers you can buy at your local craft store. They come in a variety of colors and flavors. I decorated half the rounds while still on the cooling rack to allow excess to fall through the rack, and broke off any bits that were hanging off the edges before assembling. Traditionally, whoopies are individually saran wrapped and for me, that’s part of the delivery of whoopie pies. Your choice, anyway you choose to serve them—enjoy!